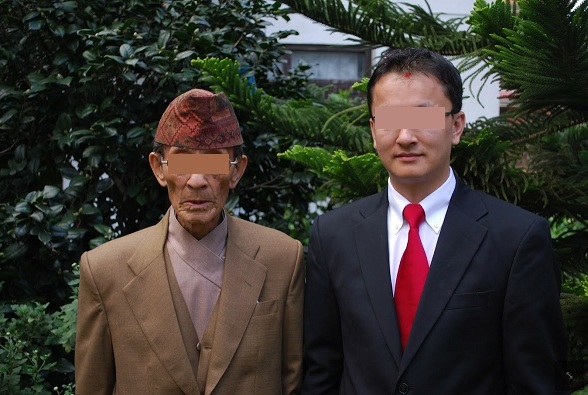 It’s been five days since we received the unexpected news—a series of calls from Kathmandu that ended with the death of P’s grandfather. It has taken me a few days to think about what I wanted to say. It was quite a surprise, even though he was 88 years old, as he was very strong and active. Hajur Bua was a very important person in P’s family, but I think he was of particular importance to P, who was the first born grandchild. Hajur Bua lived with P since childhood, teaching him how to play many sports, including his favorite—heck, it’s his passion—soccer. He used to walk little P to school every day and then pick him up and walk him home. He was the “keeper of the house,” the person who was always opening the front gate or looking out the window to see who was coming and going when he heard its clank. 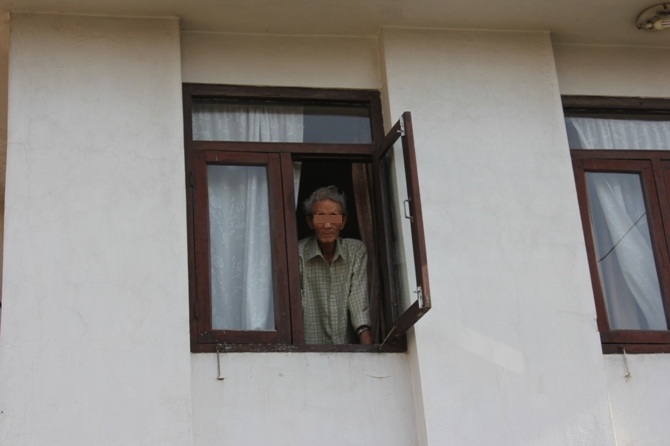 Upon arriving at P’s family’s house in Kathmandu he was the first face you’d see, peeking out the gate or waving from the front window or roof, cup of tea in hand. He was always there to welcome us home or bid us farewell. I first met Hajur Bua when I visited P’s family in 2005. Even then, I had heard many stories about him, and I was happy to have the chance to meet him, as I wasn’t sure when I would be able to come back or if I would meet him again. Luckily I had two more opportunities: He was there again in 2009, telling us stories about his time as a park ranger in Chitwan, acting out sitting on an elephant’s back during a tour. He liked to bring pictures out to share, or his school leaving certificate of which he was very proud. We were able to take our first married Dashain tikka from him. It would be my first and last. I remembered seeing him many times sitting on the floor, cross-legged, like a man sixty years his junior. I couldn’t imagine my father being nimble enough to do that, let alone my grandparents. It was a testament to his health and fitness. And then there was Rai Uncle, a former neighbor, who still liked to come over and spend time with the family. Hajur Bua and Rai Uncle had a love/hate relationship. Like two grumpy old men, they sometimes had feuds—“He took my umbrella!” “You cheated at cards!”—but they were companions as well, sharing in card games and conversations. Hajur Bua also had a love of plants, a hobby I share. Back in Kalingpong, his home area, his family had a nursery with many interesting plants, and as an older man Hajur Bua tended to dozens of potted plants surrounding the P family home, several of which came from the nursery in Kalingpong. Many of the plants were unusual, much like the ones I enjoy collecting. In 2011 I complimented a giant green stemmed succulent plant, some type of Euphorbia, growing in a sunny spot behind the house. Before I knew it he plucked out a section of the plant, wrapped the roots in mud and wrapped the entire thing in damp newspaper and insisted I bring it home. I decided to try, and was able to sneak it in. The plant now grows on my window sill, and reminds me of him every time I see it. Our Irish friend RH was visiting Nepal at the time of Hajur Bua’s death. He was staying with P’s family for a few days, before making a quick trip to Southern Nepal. He was due back to P’s home the day that Hajur Bua died. RH took the final living picture of Hajur Bua—as he looked through the front window, saying goodbye to him before RH left for Chitwan. I almost feel as if you were meant to be there that week – to see Hajur Buba one last time. Since you met him, it almost feels as if you were there on our behalf. We also got the last photos of Hajur Buba that you took, looking from the window. It is hard to think that he is not going to be there to look out of that window next time we arrive home in Kathmandu and the next time the metal gate makes a clanking noise. The whole news has been a shock and a surprise to all of us. He was old and had minor other pains and aches but we all felt that he was this strong person who would live to be 100 or more. At the same time, he passed away the way he wanted, without being bedridden, within a matter of hours. I am also glad that you were able to hear Hajur Buba’s stories once again while you were there. I want to dedicate this posting to Hajur Bua. He always made me feel welcome and part of the family. We are all very sad at your passing, but we feel honored to have known you. The first time I visited Nepal I was in Kathmandu for four days. There wasn’t really time to meet anyone, only a neighbor’s daughter who needed to practice speaking with an American to prepare for her US visa interview, and we visited Mamu’s brother’s clothing shop where I was barely able to fit into any of the pants because I was too tall. Other than my stay with the immediate family, my visit was largely unnoticed by neighbors or extended family, so little explanation was needed as to who exactly I was or why I was there. The second time I visited we stayed for three and a half weeks. By then P and I had been dating for nearly six years and we were engaged (his family didn’t know, although they figured we would marry eventually). For the first part of our stay, our friend RH was with us, and we went hiking in Solukhubu, so having two white foreign friends at the house, probably made it easier to explain to the neighbors that we were “just friends” visiting P for the hiking trip. I stayed on after RH left, and we even went to a neighborhood wedding ceremony. As with many close-knit South Asian communities, people “talk,” so taking me to a neighborhood wedding was opening the family up to lots of “talk.” As we were getting ready, P’s aunt J Phupu said, “It anyone asks who you are, you are P’s ‘very good American friend.’ Okay? They do not need to know our business.” That trip I was always introduced as P’s “saathi” [friend]. Even though I kind of understood the logic—in a country where arranged marriages are still rather common, there was no need for the neighborhood to know that their son was with an American before we were married—but I was still hurt. I didn’t want to be P’s “good friend.” I thought after six years I could be considered at least a little more than that. I even noticed that the Nepali papers referred to one of the American casualties from the Buddha Air crash as a “saathi” of one of the other Nepali passengers. If you read about the crash in on American online news source they explain that she was the Nepali passenger’s fiancée, and had come to Nepal to meet his mother before they married. So this time it is refreshing to be here with P as a married couple. Instead of being the family secret or the “very good saathi” I get proudly introduced as the “naya buhari” [new bride]. Mamu is not ashamed to walk me by the local shops, point and smile, “naya buhari.” While the neighbors smile back, “ramro cha.” [she is good/nice]. Now if I could only speak proper Nepali back to everyone, I’d have it made. P’s family is getting ready to leave. They originally planned to depart on September 26th, but Mamu really wanted to get home to start organizing the house for Dashain, and they moved their tickets up to Sunday night (Sept 18th). They have been with us for twelve weeks. Wow, I had to recount because I couldn’t believe it when I first counted. That time went super fast. I was nervous before they came. I hadn’t had bad experiences with them before, but the idea of having my new in-laws live with me full time for such a long time felt daunting, or at least a bit overwhelming. But all went really well. I actually feel a lot closer to them than I did before, particularly Mamu, whom I get a big kick out of and really enjoy. The last time P’s family visited us it was for five weeks back in 2008. P, myself, P’s brother, P’s cousin MK and P’s cousin’s boyfriend MS dropped them (Mamu, Daddy and MK’s mother J Phupu) off at the airport. We sat together for a while, and eventually it was time for them to go through the security gates. Mamu and J Phupu were crying, but Mamu was an absolute wreck. She was sobbing and was almost too upset to coherently find her way through the security line, and Daddy had to lead her along. When they reached KTM P’s dad called to inform us of their safe arrival, and said Mamu and J Phupu cried most of the plane ride home. After such a dramatic departure last time, you might wonder if Mamu will equal, if not surpass, her level of anguish after staying with us for twelve weeks. But I don’t think so. Perhaps Mamu will shed a tear or two, but I don’t think there will be too many frowns or too much sadness this time around. We will be following them to Kathmandu next Friday. Sometimes P’s mom completely cracks me up. She comes up with things I just don’t expect. Like when I asked her, “Is there anything else you need from the store before you go back to Nepal?” she went to the cupboard and pulled out a box of microwavable popcorn, “This, good gift, I think.” She said. I had made a few bowls of microwavable popcorn when we were watching a movie one night, and I think she really liked the taste. She said her sister has a microwave in Kathmandu, so this would be a unique gift for her. “You show me how to make?” she asked, and we ran through the process of opening the plastic wrap, looking for the words “This side UP!” on the package so she knew how to place it in the microwave, and talked about microwave timings (and the possible need to experiment with microwave timings due to different microwaves and altitude). 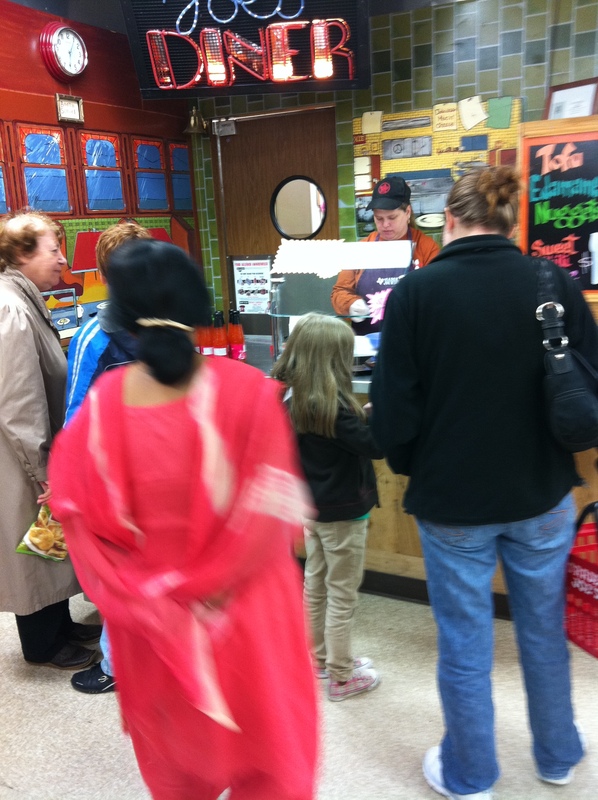 As you remember from Sneaky Mamu, P’s parents really like taste testing things at the Trader Joe’s grocery store. However the first time they went to one in Philadelphia they were scolded for taste testing too many times. So when they came to our Trader Joe’s in Massachusetts they were nervous to take more than one sample. 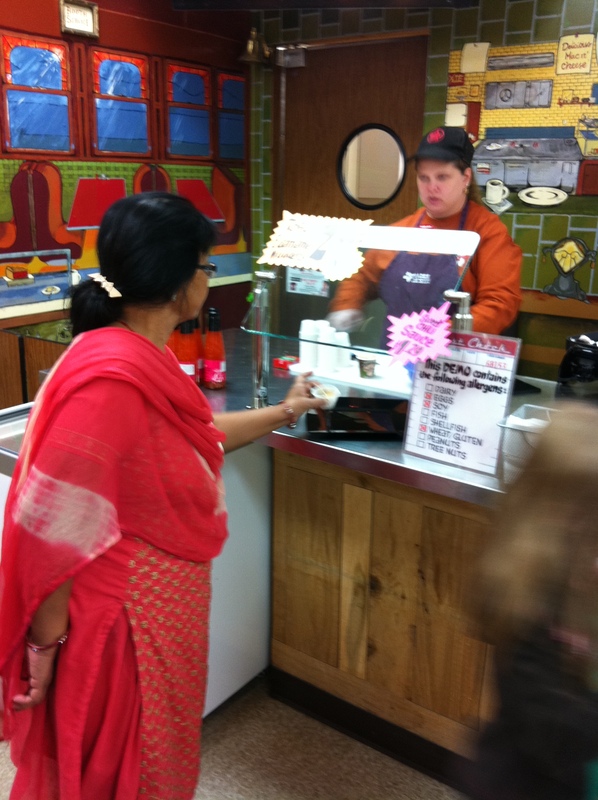 Mamu came up with a loop hole to the “only one sample” rule when the food that was on offer that day wasn’t vegetarian. She surmised we, as vegetarians, could “sneak” extra portions for P and Daddy since the server wouldn’t know that we wouldn’t eat our share. A week or two later we went to Trader Joe’s again, and Mamu was already excited in the car about what she might taste test, and was hoping it wouldn’t be a meat sample. When we got to the store she was pretty quick to start checking out the taste test stall. She asked me, “Vegetarian?” and I asked the server, and was giving the 100% vegetarian go ahead—it was a new product, tofu edamame nuggets dipped in sweet chili sauce. Mamu loved them immediately. I commented that they were good and asked if I could take a second and the server said yes. This delighted Mamu, but by the time she went for a second helping the nuggets were finished and the new round was still cooking. I chatted with the server for a bit while we waited for the next round, Mamu winking at me conspiratorially, hoping for her illicit second taste. We took a package home for dinner. These were a good find. A healthy and tasty alternative for little kids who might want a chicken nugget— mental note for a few years down the line. Tofu edamame nuggets... she shoots, she scores! We headed into the store looking for the tofu edamame nuggets that Mamu wanted to try again before she left for home, Mamu was quick to bee-line for the taste tester station. Yesterday they had crackers with jam and cheese. “Vegetarian?” she asked me. “Yep,” I answered, and handed her a paper plate with the cheese/cracker. Then I went in search of the nuggets which took me a while to track down since only a few packets were left. “I did!” and she gave me a big thumbs up, which struck me as such an American thing to do. It cracked me up, I was standing in the aisle of the grocery store giggling. Then Mamu started giggling, and we were both giggling like kids. Mamu was very proud of her double taste test. We had her tofu edamame nuggets with sweet chili sauce as a side dish for dinner. And tonight I’ll take her to the regular grocery store to find a nice big packet of microwavable popcorn. Today is my first married Teej and my first Teej with my mother-in-law. I first learned about the holiday when P and I moved from New York to Massachusetts in 2007. I’ve taken part in the festival every year since, generally by wearing red and fasting for 24 hours, and usually by dressing up in a sari and going to the local temple with several female friends (AS, S-di) at some point during the day. This year Mamu is with us, so I am letting her dictate how we should celebrate the occasion. Last night she explained that I should wake up early, take a shower so that I am “pure,” then I should dress in red clothing and wear my bangles and green and gold wedding tilhari, then we would worship Shiva and Parvati. “And fast all day?” I asked. “But potatoes? Eating boiled potatoes hardly feels like a fast.” I insisted. If one thing is true above all else, I’ll never starve as a member of the P family. So this morning I set my alarm for 6am… and snoozed it until about 6:40. By the time I was conscious enough to roll out of bed and stumble into the shower Mamu had already beaten me there. So I laid down for a few more minutes and listened to the water, waiting for her to finish. Then I showered, and dressed up in a red kurta top that Mamu and Daddy picked out yesterday. I selected ten of my red and gold glass wedding bangles, putting five on each arm, and slipped my green wedding pote with golden tilhari over my head. When I went out to the living room Mamu and Daddy were already sitting on the couch waiting. “Should I put?” I asked. “Tikka put on. Small tikka. Very pretty.” She insisted. So I went to my bedroom and fished out a packet of small sparkly tikkas from my jewelry box and stuck it between my eyebrows. While I was at it I asked P to put a small dot of orange sindoor at the part in my hair. “Good,” Mamu said, and we walked to her bedroom where she had a small altar set up on the dresser. She had folded the Nepali calendar she brought with her from Kathmandu so that a picture of Shiva and Parvati was facing upward. In front of the picture she had a cucumber, a banana and an apple on a plate. She lit two incense and said, “Today we pray for the long lives of our husbands,” and motioned for me to pick up the plate of fruit/veg. I circled it in front of the gods’ picture and then she gave me the incense she had been holding. She folded her hands in Namaste and whispered a quick prayer. After I circled the incense she took them back and stuck them in the cucumber in front of Shiva to finish burning. She then motioned for me to touch both the heads of Shiva and Parvati, and then touch my own forehead with my right hand, then motioned for me to touch the two images of Ganesh and again touch my forehead. She took me to the kitchen where she had two small boiled potatoes on a plate ready for me. I felt like I was cheating. I kind of like fasting. I don’t have many opportunities to do it and I like having a reason to abstain from food—it’s like a personal challenge, and it makes you think about what it is like for the people in the world who have to go without. It teaches you discipline, and gives you some clarity. I have great respect for people who fast for Ramadan. One day of fasting hardly seems like a sacrifice. I guiltily took one of the small potatoes and took a small bite. “But I have many!” She said, lifting the lid off the pressure cooker to reveal another four or five floating in the water. “And sweets?” she asked. At the Indian grocery store last night she had picked up two boxes of sweets—barfi and jelabi, and a canister of rosgolla. She thrusted three barfi into my hands. “I’ll eat one now and take one for dessert.” I said. So now I am sitting in my office with tikka, sindoor, tilhari, red kurta, and glass bangles. In my own office it doesn’t matter so much… I’ve dressed “international” before, and it is more accepted by our student population (being that they too are international), but I have to meet with a domestic student today that the university administration asked me to take off campus for a serious issue tomorrow morning, so I am a little shy about meeting her all “Nepali-fied” and having her think I’m “weird.” I also have to host the campus religious diversity center open house—which I guess dressed in Hindu festival attire I won’t be too out of place, but I prefer my bubble of cultural diversity when dressed in this way. The plan for the rest of the day is that once I get home from work I’ll dress up in a new maroon silk sari that Mamu brought me from Nepal specifically for Teej and go to the temple where P and I got married with Mamu and S-di. This post is dedicated to our DEAR FRIEND D who said last night, “I know what C’s blog post will be about tomorrow… I even know the title” and who was sad that a few posts ago I referred to him as “our neighbor D” and thus felt demoted in relationship status. We had some gusty winds, but never lost power (although it seems a lot of other people around us did), and didn’t have the same flooding problems as other places an hour or two drive north or west of us. By evening the weather calmed enough for us to even go out for a little birthday dinner and cake. After Irene blew through the weather cooled off, so I thought I would experiment with some “American autumn” inspired food. Always on the lookout for foods that I love, that I could try and introduce to Mamu and Daddy, during our pre-Irene grocery shopping I snuck a bag of brussels sprouts and a butternut squash into our cart. “Is it a pharsi? [pumpkin]” Daddy asked. “It’s in the pharsi family, it’s a butternut squash” I explained. —then sautéed some sliced onions, garlic, salt and pepper, added the butternut, and then a few cups of water and some veggie bullion. I let it boil, covered, for about ten minutes until the butternut was soft, and then poured the whole soup into the blender and pureed. Lastly I heated the pureed soup with a bit of whole milk mixed in for creaminess, and then brought it to the dinner table in a serving bowl. I turned back to the kitchen to grab bowls for everyone but before I returned to the table Mamu and Daddy had already ladled my “pharsi soup” on to their heaping piles of rice—“like daal!” Mamu exclaimed. “Whatever gets you excited about it” I thought. I returned the bowls to the kitchen, keeping one for D and myself, since we both elected to eat my soup like soup. Mamu, Daddy and P had a few more spoons of “pharsi soup—like daal” on their rice while I finished up my large bowl. Finally an American culinary win! I’ll take it, “like daal” or not! I wanted to share one of my favorite pictures. It looks a little like a mug shot, but the message is absolutely priceless and hilarious. Our friend AD made the perfect choice. The white board reads, "I'm glad today happened despite me being a horrible mediator." Shortly after P told his family (“He Told Them!“) about our relationship our friend AD (pictured above) traveled to Kathmandu to visit family. During his trip he was also charged with the task of “talking me up” (positive reinforcement) to the P family. At the time P’s parents and aunt had kept P’s “I’m in love with a white American” story secret from P’s talkative Grandfather in case P was just “going through a phase” and would eventually leave me and marry a Nepali someday. When AD and KS showed up for lunch that fateful afternoon in January 2005, every time AD dutifully brought me up in conversation one of the “Main 3” (mostly J Phupu) would shut him down or change topics to deflect the “match maker/mediator” role that AD was not so subtly fulfilling. Six and a half years later, Mamu, Daddy, and AD sat in the audience watching P and I get married. It made me laugh to think about AD’s message concerning his skills as a mediator (it wasn’t his fault he kept getting deflected! ).